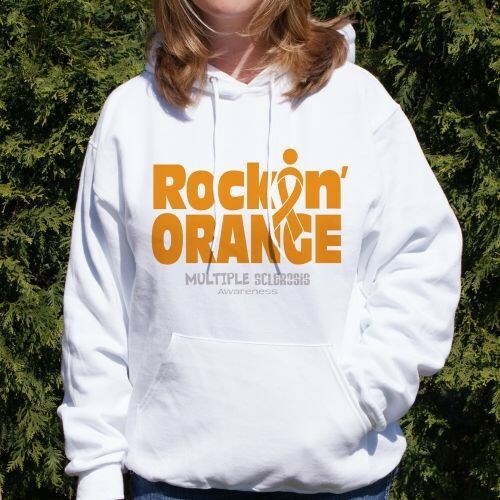 "Rock Orange" at your next MS awareness walk or fundraising event! This would be a great awareness hoodie for you and your walk team to wear to show your support for friends and family members who are currently fighting MS. This would be a cozy sweatshirt to wear year-round, as well. This MS Awareness design is printed on our 50/50 cotton/poly blend hooded sweatshirts, machine washable in youth sizes S-L and adult sizes S-2XL. Additional Info Shop more of our MS Awareness Apparel for any and all of your MS awareness walks or fundraisers. You and your team can demonstrate how important the fight for a cure to MS is to you. Our Rockin' Orange MS Awareness T-Shirt is another top-selling design.